I have lived in Wichita, Kansas for over 30 years. Wichita is a “Plane Town”. A large number of Wichitans build aircraft at Cessna, Learjet, Spirit and Beech. Aviation is no casual thing around here. For most people in the aviation business, it isn’t just a job – it is a passion – a lifestyle. We have many airports and fairly constant air traffic. People turn out in large numbers for aviation events and today was no exception. Being a pilot and lifelong aviation enthusiast makes Wichita a great place to live for me. My home is within a few degrees of being directly in line with Col. James Jabara Airport. We live exactly one mile South of the end of the runway. I get to see all types of civilian aircraft land there because final approach to Runway 36 is directly in front of my house. I heard about it landing at Jabara at 8 am this morning. I immediately dropped what I was doing to go see it. I took a few pictures of the big machine for you to see. Crowds built continually throughout the morning. At 8 o’clock, traffic was starting to build so I grabbed this shot out my car window from Webb Road in case I wouldn’t be able to get any closer. Back in the 80’s and early 90’s, I would take breaks from my work and drive out to Jabara to watch planes land and take off. Then, the field was a very short asphalt strip. Interestingly, what used to be the landing strip is now part of the driveway access to the hangar and FBO office. 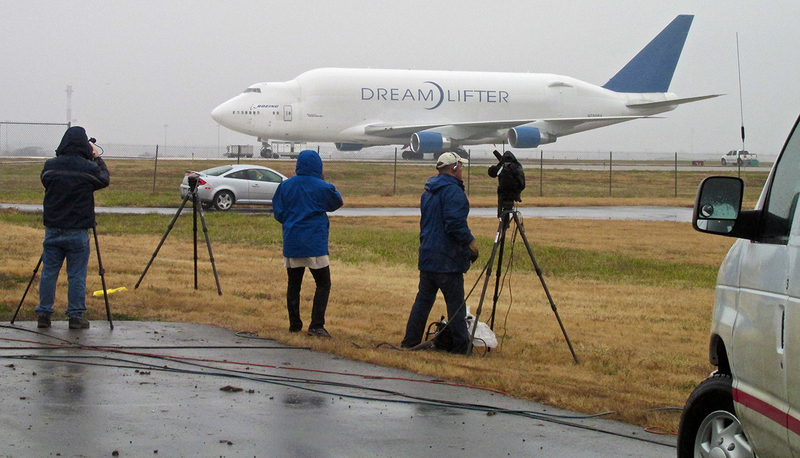 The runway Dreamlifter decided to alight upon came much later. Even then, there were no fences around it. 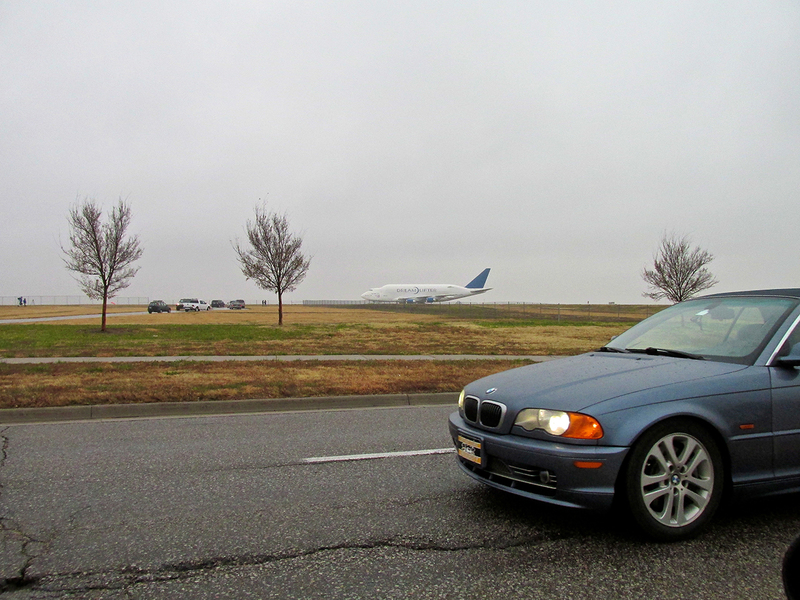 Often I would grab my children and we would jump in the car and drive right up to the tie down area next to the planes. From this spot I have seen B-17’s, a B-24, a P-38, some P-51’s and a Ford Trimotor. Just some of the notables that come to mind. Although the “front quarter” shot above is my favorite angle for airplanes and cars, I knew this hulking monster deserved another viewing. Also, I wanted to show you some of the attention that was building around it at 8 am. I pulled around to the position below nearest the South end of the runway. This scene was of interest to me because I had once worked for the local NBC affiliate. I would always show up a half hour early for work so I could grab the keys to the microwave remote truck because I liked being involved in this type of action. We call this “Spot News”. Back then, though, it wasn’t these “momma vans” you see in the picture above. I drove a 4 Wheel Drive K-Blazer. It was a blast. One of these Dreamlifters was shown at the McConnell Open House two years ago so I examined it up close. I was impressed that you can walk underneath the length of the fuselage upright and I am 6′ 1″ tall. I know this piece needs the take off for an ending but I don’t have it. I went back out to the field twice to get it taking off but they delayed takeoff both times. 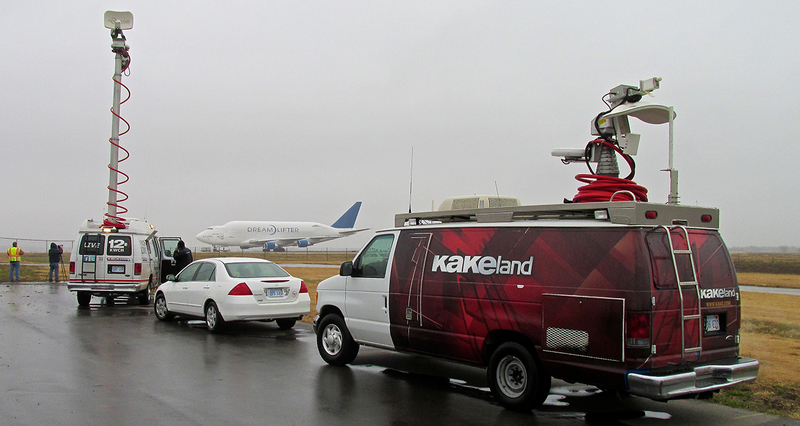 Traffic was increasingly thick on all sides of the airport as the waiting game continued into the early afternoon. The best photo angles were blocked by the police for safety. After the two tries I decided I had burned enough of my work day on the project and left it as you see. When finally lifting into the air, the Boeing had so much excess power it was airborne with half the 6100′ runway to spare. Doing that takes some serious, petroleum-based thrust: FIRE! Taking that into account, my crystal ball doesn’t reveal the slightest hint of (or need for) any butterfly-safe, “green”, battery-powered, electric motor, “carbon neutral” Dreamlifter for the foreseeable future. That’s fine by me.